As a result of the demand for tickets to listen to Craig Ogden, one of the world's greatest classical guitarists, the landmark 40th Village Hall Talk on June 8th 2012 was moved fifty yards to St Mary's Church - which could both accommodate more people and also provide a better acoustic for a magical guitar. The audience wasn't disappointed and the evening proved to be one of the most memorable so far. Over the course of eighty minutes, Craig played eight beautiful pieces, explaining the background to each one, including the technical complexities, and he also detailed the crucial requirements of a classical guitarist, in particular the constant attention to the condition of the nails on the right hand. On occasions, he said, some even attach slivers of a ping-pong ball to their nails in order to strengthen them, whilst the ends of the fingers on the left hand develop callouses and a flat shape after endless hours of depressing the strings. Craig's pieces included the breathtaking Recuerdos de la Alhambra, composed in 1896 by the Spanish composer and guitarist, Francisco Tarrega, who was inspired by the magnificent Moorish palace in Granada, and Django Reinhardt's composition, Nuages, with its elements of swing. Earlier, Craig had begun the evening with the beautiful Grand Overture by the early Nineteenth Century Italian guitarist and composer, Mauro Giuliani, and he later played a tango, Milonga del Angel, by the Twentieth Century Argentinian composer, Astor Piazzolla. He also included Asturias, by Isaac Albeniz, Vals Op 8 no 4 by Agustin Mangore Barrios and an evocative recent piece composed by Gary Ryan, from the Royal College of Music, called Rondo Rodeo, which even included sounds on the guitar depicting hogs and horses. His encore was one of his own compositions, called simply Australian Piece - based on a return trip to his native Australia, capturing all the evocative sounds of different places and times of day in that wonderful country. Craig's guitar - a Smallman - cost over £18,000 and was made in Western Australia and he detailed the intricate work on the instrument, such as the number of frets on the neck being limited to nineteen, so the maker's arm could be inserted to carry out delicate adjustments to achieve the perfect resonance on the sound-board. It is his latest instrument following a remarkable sequence of events in London, in which both Craig's guitar and that of a fellow classical guitarist were stolen by the same thief following a complex plan of deceit. Neither instrument was ever recovered and Craig is still mystified as to the motive, given that it would be very hard to sell on as each guitar has identification markings. Craig has played with some of the world's major orchestras in some of the most famous venues. 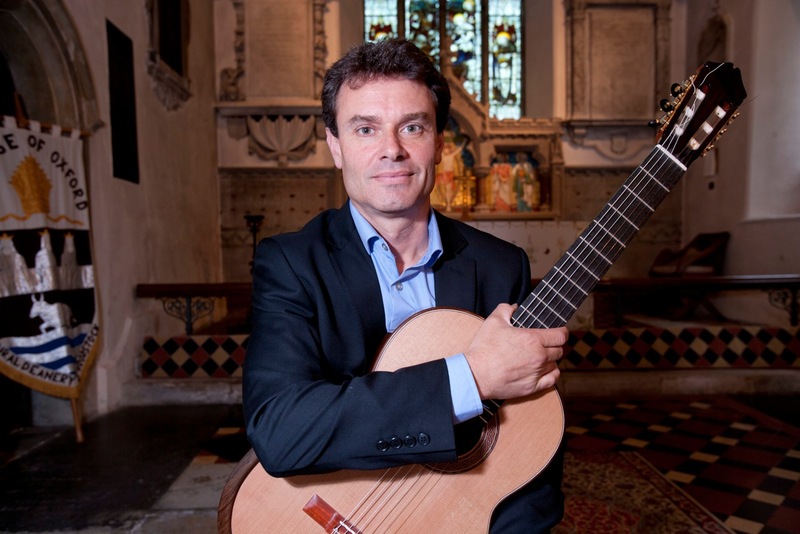 His recordings, including all three Rodrigo guitar concerts with the BBC Philharmonic Orchestra, as well as best-selling albums made for Classic FM, have also been acclaimed around the world and he brought along to Wootton a number of his CDs, which sold rapidly following his inspiring talk. Over 140 people packed into the church and the overall profit from this wonderful evening was £823. 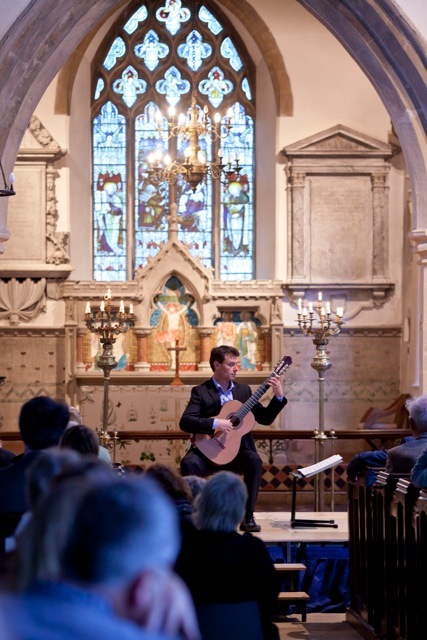 "This was the first Wootton Talk to be held in the church and it was an excellent setting for Craig Ogden's magisterial appearance, with the buildimg's acoustic complementing the beautiful sound from his guitar. Craig was an inspiration - a magnificent musician, modestly informing us about the preparation and techniques of professional guitarists and recounting anecdotes with self-deprecation and charm. He was the prefect speaker for the 40th Village Hall talk and many of us buying his CDs will treasure memories of the evening for years to come" - Farzin Rahmani, Woodstock.